Happy Literary Friday, y'all! 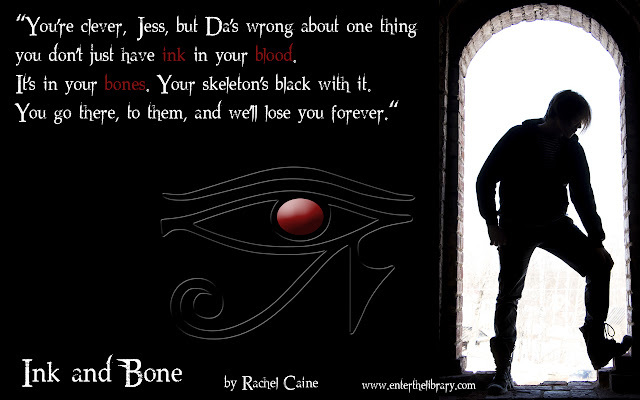 This week I read the first book in a brand new series by Rachel Caine (of Morganville Vampire fame). 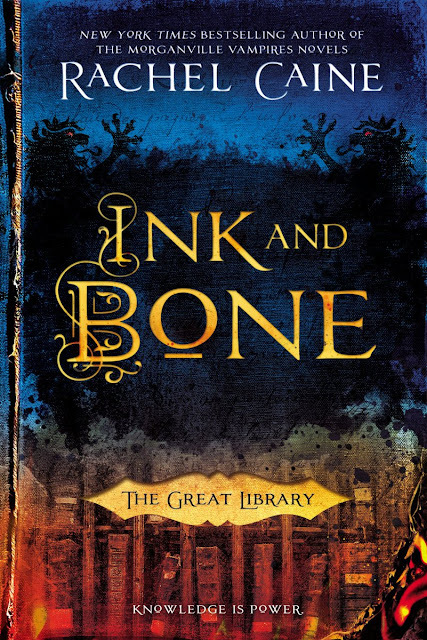 Entitled Ink and Bone, it introduces the reader to The Great Library series and a very dark world where knowledge is controlled by librarians. They rule the world. Imagine a world where the Great Library at Alexandria was never sacked. It has thrived, and it has sister libraries throughout the world including the Bodleian Library at Oxford University. Imagine a world where individual book ownership is forbidden: People are allowed to read texts via an alchemical process instantly, but the text disappears once read. Imagine a world at war, where the rebels, or burners, attempt to overthrow the library and its power. Can you even begin to imagine such a world? Frighteningly scary, just in time for Halloween! Jess Brightwell values knowledge and books. His affluent London family has made its fortune in the book and manuscript black market. Jess is sent to Alexandria as a postulant to train to be a librarian and his family's spy. Soon he and his classmates are sent on a dangerous quest to war-torn Oxford, England to save the rarest books from the Bodleian. But Jess and his fellow postulants are constantly threatened by the Welsh Army, burners, and high-level library scholars. When one of Jess's friends designs and builds a machine that could possibly change the world, Jess learns first-hand the ruthlessness and power of the Library. This series will be a hit. I love how Caine has included ancient concepts and history like alchemy, automata, and Greek fire in the book. I also learned from her website that the Great Library of Alexandria often confiscated original materials from private owners and merchants. You can read all about the Great Library and other historical inspirations here. What did YOU read this week? This is a linky! Hello, My Lovelies! Happy Random Tuesday! We're busy getting ready for Halloween around here. What about you? Do you get lots of Trick or Treaters? Candy corn is about as scary as it gets around here! 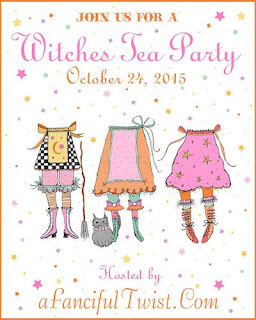 I enjoyed participating in Vanessa's Witches Tea Party @ A Fanciful Twist. You can visit my party here. If I haven't visited your blog during the past several days, it's because you didn't host a party *sadface* I still have several more blogs to visit. They have been fun! 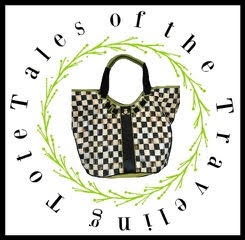 Our friend the Nana Diana is one of the sweetest bloggers *ever*. She is a prayer warrior, and she's constantly sharing prayer requests with her readers. Plus she's funny. She's actually wicked. 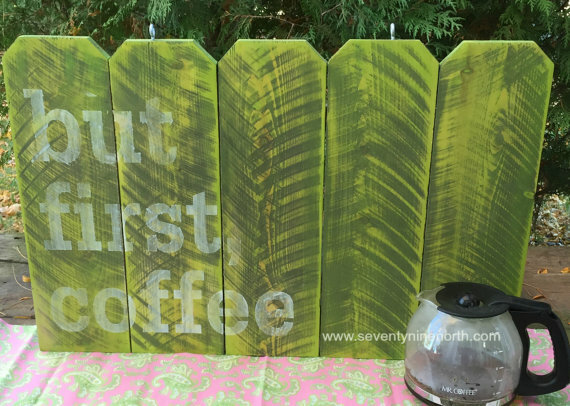 Last week she shared her son's latest hobby/side business, and I think they're fun. 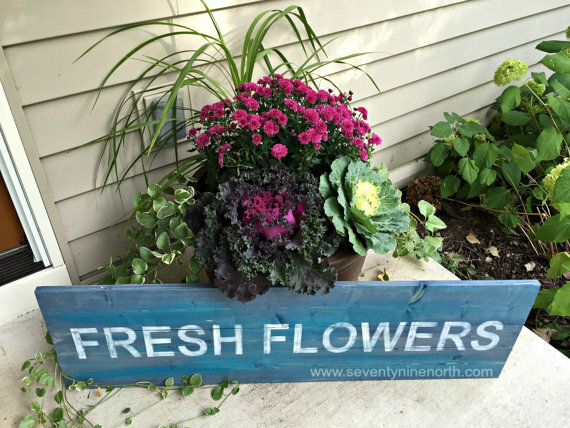 He and a friend are making signs and selling them on Etsy, and their shop is called 79 North. The posts are fun to read, too...they are witty. There's a mean witty gene in that family I tell ya! Check out their Facebook page here. 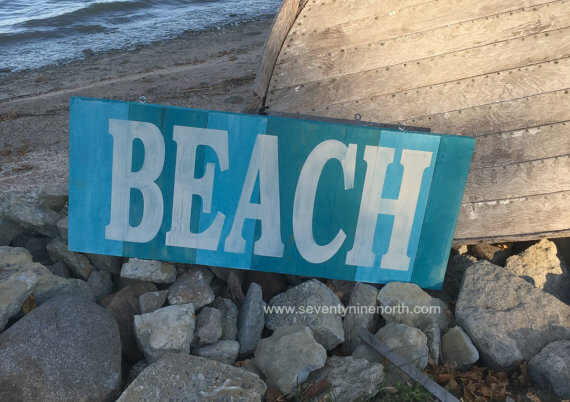 Diana is hosting a giveaway for one of these signs until Halloween. Here is the link to her post. Finally, Shelley received THE acceptance letter to college...to the college of her dreams, Judson College in Marion, Alabama. I'm happy she'll be close to home, and I'm happy she's (soon to be ) a Judson Girl! 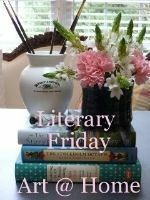 Please come back Friday for my Literary Friday post! Next semester we'll study "The Scottish Play" by Shakespeare, so I thought the the Three Witches' Chant would be appropriate for our after school party. Don't you just love the taunting way Shakespeare switches from his usual iambic pentameter to trochaic tetrameter in this scene? 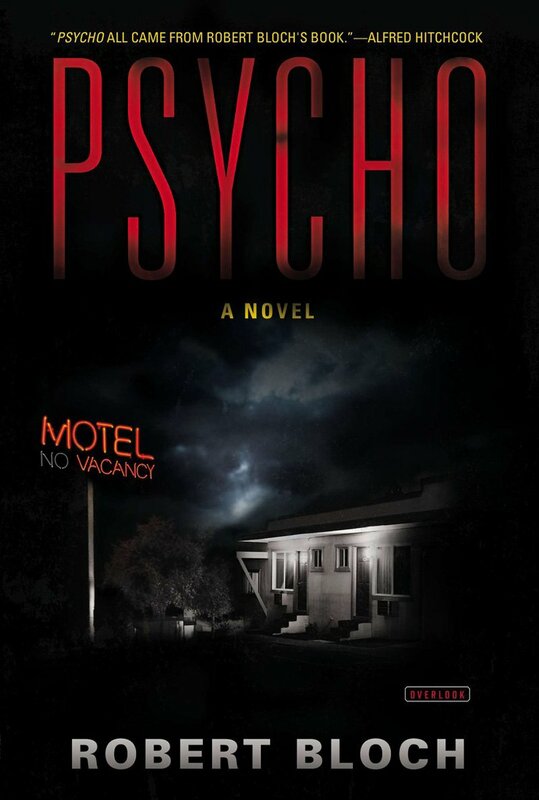 This week I read Psycho by Robert Bloch. This is the book that inspired the movie by the same title directed by Alfred Hitchcock starring Anthony Perkins and Janet Leigh. It is our Book Club's selection for October. Oh, yes, he's odd! Did you know that Psycho was based on a real life sick freak named Ed Gein? If you really want to have nightmares, please read about this twisted criminal. This book is very well-written. Although Anthony Perkins was way too good-looking to play the Norman Bates in the book, I believe that Hitchcock did a very good job with the film's adaptation of the book. Since most of you are familiar with the story, I won't spend much time rehashing the plot. Bloch's fast-paced book makes for a quick read, plus it's only around 200 pages, so you can read it in an afternoon. He truly writes a complex character study of Norman Bates, and his revelations about Norman's illness is slowly peeled away in layers like an onion to reveal the root of his neuroses. Have you read any scary books for Halloween? I'm done. I don't like scary, truly I don't. I'm off to read about fluffy bunnies, rainbows, and unicorns. Today after school and book club, Shelley and I will be working hard to prepare for tomorrow's party. We hope y'all will come join in on the fun! Happy Random Tuesday, My Lovelies!!! We've had a wonderful week of autumn fun. Lucky Dog Grooming sponsored this scarecrow. This one if from Mr. Harry's Chickin De-Lux. No, this is not a typo! 2. Finlay loved the dog park! 3. We visited a model home at Mt. Laurel. I loved the master bathroom and kids' study best! This year Mt. 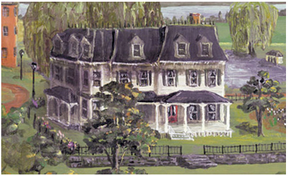 Laurel will host the Southern Living Magazine's idea house. They will break ground on it soon! 3. Have any of you heard about the new NOOK readouts? Check it out! I'm enjoying reading the blurbs. 4. Happy 23rd Birthday to my #1 daughter, Shanley Belle! I am so proud of the woman you've become. Shanley Belle reading to Shelley. She was helping Shelley with her SLP (speech language pathology). Now, Shanley is in a graduate program for communicative disorders, and is working on a dissertation that will enable her to earn her PhD. 5. 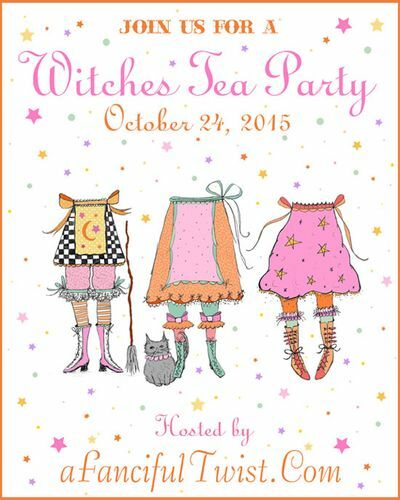 Shelley and I are preparing for the Witches' Tea Party @ A Fanciful Twist, so this is the last post until Literary Friday. Saturday we'll be busy visiting everyone's party. It should be fun!